Perry Como (May 18, 1912 – May 12, 2001) was an American singer. He was born to Italian parents in Canonsburg, Pennsylvania. 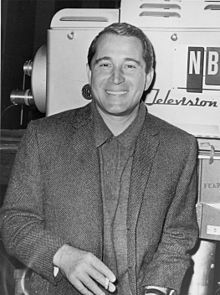 He hosted a television show The Perry Como Show in the 1950s and 1960s. Como gave credit to Bing Crosby for his singing style. The Kennedy Center honored Como in 1987. ↑ "CNN.com – Entertainment – Singer Perry Como dead at 88 – May 12, 2001". Archives.cnn.com. Retrieved 2010-01-07. This page was last changed on 9 April 2015, at 03:35.